Heat oven to 275°F. Place ribs meat side down on cutting board. Locate thin membrane covering rack. This membrane can be tough when cooked. To remove, use knife to gently slide under membrane then using fingers, pull membrane away from bones. If slippery or difficult to remove, use kitchen towel to take hold of membrane and pull. Season both sides of ribs with salt and pepper; place in large roasting pan. (It may be necessary to cut ribs in half in order for them to fit into pan). Cover with 2 sheets of foil. Roast 3 hours 30 minutes to 4 hours or until pork falls easily from bones. To make barbecue sauce, in 2-quart saucepan, heat oil over medium heat. Add onion; cook and stir until translucent. Stir in cumin. Add ketchup, brown sugar, Sriracha sauce and vinegar; stir to combine. Season sauce with salt. Cook 2 minutes. Set aside. Remove ribs from oven; uncover. Generously brush both sides of ribs with barbecue sauce. Move oven rack to top rack position in oven; set oven control to broil. Broil ribs 3 to 4 minutes or just until sauce begins to caramelize. Choose your favorite barbecue sauce instead. 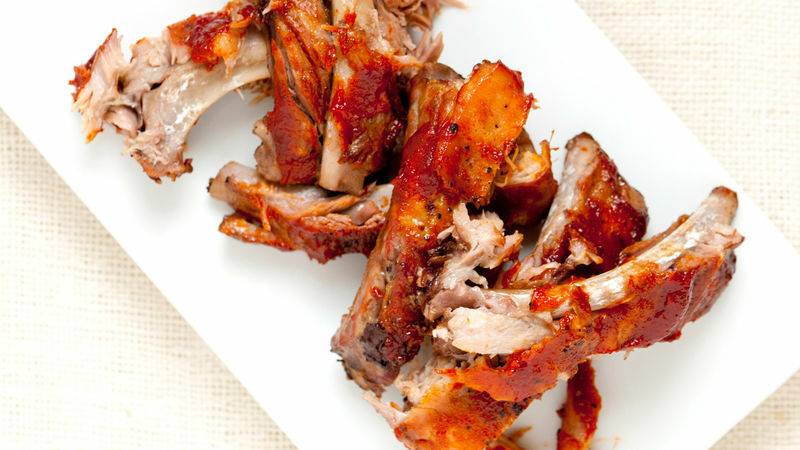 Roast ribs per the recipe above, then brush with the sauce of your choosing. Instead of only sprinkling salt and pepper onto the ribs before roasting, you can add a dry rub for added flavor.